I don't know why, but I think it's so cute in the movie, Monster's, Inc. when Boo says, "Mike Wasowski!" And although the connection between Boo and Sully makes a person want to say "aaawwwww", I love the character Mike Wasowski. 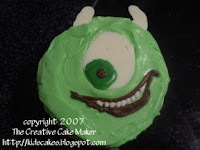 So in tribute, here are some Mike Wasowski cupcakes. I came up with the idea for these on the same day I dreamed up Jack Skellington cupcakes. I was sitting at the kitchen table drawing circles on a piece of paper and "designing" cupcakes. I looked to my kids' DVD collection for inspiration. Kids are wonderful that way. If they can recognize a favorite character, the cupcake becomes so much more special to them (and they'll overlook the mistakes).